CR has learned that that Fantagraphics wishes to make public that it's reached an agreement to publish a major, all-but-complete collection of Crockett Johnson's Barnaby. One of the best comic strips of the 20th Century and one of the most beloved older strips for a generation of devoted adult comics fans, Barnaby had become in the last decade and a half the great unsigned strip collection. The deal was negotiated by Eric Reynolds on Fantagraphics' behalf. The first volume will come out in April 2012 to coincide with the release of Philip Nel's much-anticipated biography of Johnson (The Purple Crayon And A Hole To Dig: The Lives Of Crockett Johnson And Ruth Krauss from the University Press Of Mississippi). Nel will serve as series consultant and write an essay that will be paired with introductions from comics luminaries. Reynolds will be the series editor. Dan Clowes will supply the art direction. Barnaby began publication in April 1942 in the leftist newspaper PM. It was later syndicated in 64 newspapers. 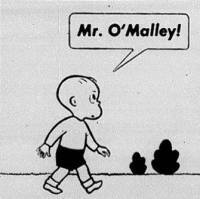 The strip revolved around a five-year-old named Barnaby Baxter and his fairy godfather Jackeen J. O'Malley. The basic twist was that O'Malley far from the typical fairy protector as one might imagine. O'Malley smoked a cigar, he wore an overcoat, and his magic-making seemed restricted to occasional flashes and relationships with several other oddly-depicted members of the fantastic world just beyond our ken. He was more Peter Falk than Fred Astaire, although his affection for and interest in the boy always seemed heartfelt and sincere. Barnaby became a darling of those members of the cultural intelligentsia inclined to read the funnies, and was the recipient of perhaps the most unguarded words of praise in Dorothy Parker's long career: "I think, and I'm trying to talk calmly, that Barnaby and his friends and oppressors are the most important additions to American Arts and Letters in Lord knows how many years." For all that praise, Barnaby was only a moderately successful strip. There were two collections (1943's Barnaby and 1944's Barnaby and Mr. O'Malley), a stage-play adaptation, and a radio show. A Sunday-page Barnaby not related to the daily ran briefly in the early 1950s. Johnson created the daily by himself until 1946; Jack Morley then created it, first with co-writer Ted Ferro and then without him. Johnson was during the Morley/Ferro and Morely solo period a story consultant and returned to the feature to write and draw its last episode. The strip ended in February 1952, in one of the most highly-praised conclusion to a comics effort in the medium's history. Eric Reynolds says that the Fantagraphics collection will include the Morley/Ferro and Morley solo strips, due to their relative high quality and Johnson's involvement. The books will not include the 1960s' re-do or scattered pages done here and there for various collections, choosing instead to focus on the material that serves as the basis for the strip's reputation. Like many critical favorites, Barnaby has enjoyed a long afterlife, arguably matching or even eclipsing its initial impact. A Mr. O'Malley television serial starring Bert Lahr and Ron Howard (making it as deftly cast as any comics adaptation ever) ran on 1959's GE True Theater. As mentioned in the previous paragraph, the strip was revived with modern references -- altering references to a war-related blackout, for example -- for a brief run in the early 1960s. 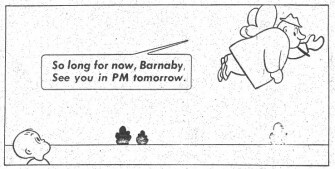 Barnaby was one of the strips that received a boost from its appearance in 1977's massively influential Smithsonian Collection Of Newspaper Comics. A paperback book program from Del Rey flashed to life in the 1980s, books that are in some ways more difficult to find than the 1940s hardcovers. 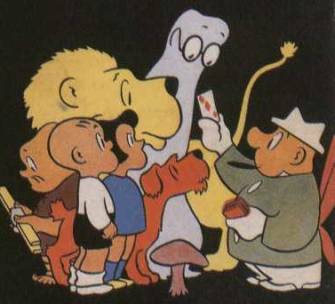 Barnaby's reputation was of course absolutely enhanced by Johnson's much-loved work in kids' books, including the Harold series kicked off by 1955's Harold And The Purple Crown. Johnson died in the mid-1970s. In 1999, The Comics Journal put Barnaby at #68 on its Top 100 Comics of the 20th Century list. Philip Nel has has an impressive Crockett Johnson site up since 1998, and Johnson's stand-alone Barkis book was one of the earliest vintage cartoon works I can recall seeing posted on a comics site. 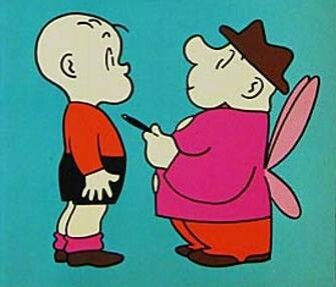 An archival-type collection of the Barnaby strips has been discussed in comics chat rooms and in editorial offices for over a decade, talk that's intensified as the great strips of the 20th Century have all but sorted themselves among a half-dozen publishers interested in publishing such works. Johnson's status as a bookstore icon for his Harold work may have delayed a collection of the Barnaby work, as a large body of work from a major bookstore icon arguably brings a different level of consideration than a more obscure work. In 2006, discussion of a Barnaby movie brought speculation that a reprint of the strip might come such a film's debut. No matter its provenance, it's welcome to have a Barnaby collection now. Also of interest is Dan Clowes' involvement as designer, as this marks his second major strip project after the forthcoming Nancy series. What a happy announcement.